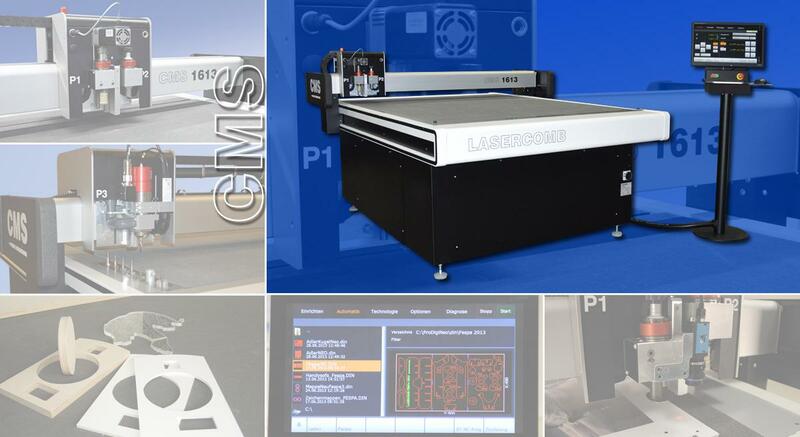 With the CMS, Lasercomb 2018 has introduced a completely new and completely renewed generation of digital processing systems. The machine is designed for the production of samples and small batch production. Complete integration into the customer's network, remote maintenance function, high ease of use and versatility make this system stand out. A stringently structured user interface guides the user through the parameterization of the process data in a clear format. Well-designed database guarantees flexibility in configuration and speed in production. As a medium, two different touchscreen models are available with either a comfortable 10 "display or with 22" screen and increased computing power eg when using a camera on the machine. Combined with the powerful finishing software OptiScout, maximum workflow integration is achieved. There are several options for your CMS. Therefore, the system is versatile and meets your requirements. Efficient and precise machining of all conventional materials made possible by a powerful high-frequency spindle with 1 kW, designed for up to 50.000 rpm. This option includes an effective suction. Application: Milling wood, synthetics, acryl etc. Tool magazine with 5 freely configurable tool stations and an integrated tool cleaning station. With the non-contact tool measurement, which is integrated in the machine body, they measure the tools used - and thus ensure an exact machining depth. The frequency of the measurements can be selected in the user interface. The main application is the exact registration of position, position and possibly scaling effects when working on already printed materials to cut prints with precise contours. In addition to the finishing software OptiScout, maximum integration of the workflow is achieved. Easy to apply stop bar for X and / or Y direction for mechanical alignment of manually applied materials. Vacuum zones to ensure a continuous operation. multifunctional flatbed machine CMS for cutting and milling contours ..
Multifunctional tool heads – Specialized for your application! Our universal creasing wheel/creasing skid holder with various inserts always ensures the best creasing or squashing. Developed and optimized for cutting through and scratching on varnished panels or other technical materials. Universal tool holder unit for tangential cutting of various materials with knifes. Universal pen unit for accurate marking and sketching on various materials. Cutting tool with high oscillating rate for various materials up to 19mm thickness. Circular blades to cut through glass-carbon fiber materials or other technical materials. V-cut cutting unit to make precise 45° bevel cuts for mats or picture frames up to 15mm thickness. Our oscillating creasing Skid Unit is optimized for perfect creasing or squashing on rigid and tough material. With our high-frequency milling spindle you are best equipped for milling on rigid and soft material.